After obtaining his degree in Law from the Complutense University of Madrid, he started his career within the Group in Spain, taking up the position of Branch Manager at the former Banca Commerciale Italiana branch in Barcelona and, later on, that of Deputy General Manager at the branch of Madrid, a position which he held until 1998. In the following year, he served as General Manager at Banque Sudameris Uruguay (1999-2002), then at Banco Sudameris Chile (2002 -2003) and at Banco Sudameris Paraguay (2003 – 2004). He was also board director of Banco Sudameris Argentina, Banco Wiese Sudameris Peru and Banco Sudameris Colombia. In 2005, he became Deputy Chief Executive Officer and Vice-Chairman of the Management Board of VUB Banka where, in August 2007, he was appointed Chief Executive Officer and Chairman of the Management Board, a position which he held until September 2013. Over the years his other responsibilities also included board member positions at Uruguayan, Chilean, Paraguayan and Slovak Bankers Associations and at Italian-Uruguayan, Italian-Chilean and Italian-Paraguayan Chambers of Commerce. He also held the position of President of the Italian-Slovak Chamber of Commerce (2009 – 2012). 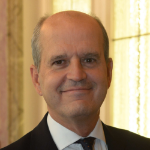 Since 2013 he has been Member of the Board of Directors of Intesa Sanpaolo Holding Luxembourg and Vice Chairman of the Supervisory Board of VUB Banka, where he became Chairman in March 2018. In June 2016 he was appointed Member of the Board of Italy-China Foundation and in June 2018 he became Member of the Board of Directors of Fideuram Asset management Ireland (FAMI). In 2012 he was awarded of the honour of Commendatore Ordine al Merito of the Italian Republic.